The problem of water logging on their Goomalling farm has prompted the Morris family to once again jump in with the tree planter. 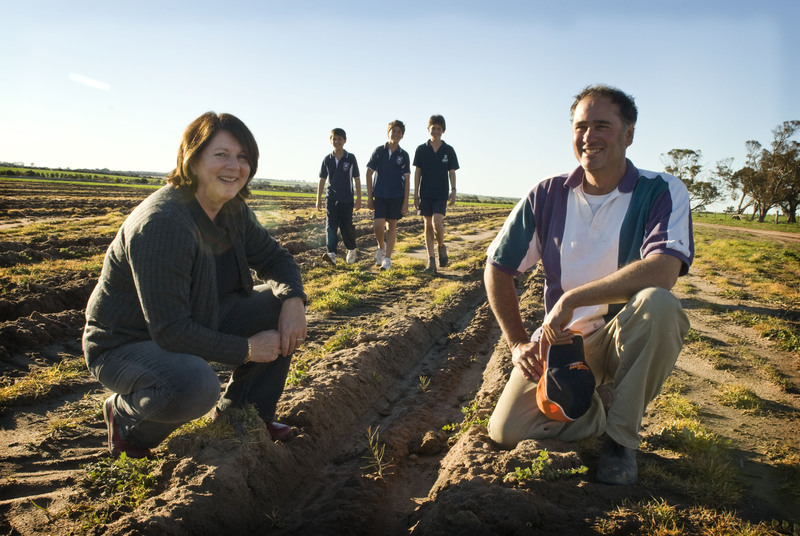 John and Julie and their three children Jacob, William and Toby spent a wet week in July planting 17,500 seedlings. Nearly a third of the 3400 hectare farm is affected by salinity, but the drier seasons over the last ten years have helped reduce the problem of water logging. “It was a very dry start for our cropping program right up until the end of May, but since then it’s been fantastic,” John Morris said.
. The ACC program was worth $500,000 and resulted in about one million seedlings planted in the WA Wheatbelt this year. The funding originates from the Australian Government’s Caring for our Country program. “The last time we really got stuck into tree planting was in 2001,”John Morris said. “But we could see more work needed to be done, and we were learning not to crop certain parts of the farm which were susceptible to water logging because the margins weren’t there. “We used to grow a lot of lupins but had to stop because they couldn’t handle the water logging and you would end up with bare patches which restricted your cropping rotation. ” Through the ACC, the family was able to obtain casuarina obesa and bushwood seedlings which were expected to make a big difference to the area in the next four to five years. “It’s too soon to tell if our strike rate has been good but we haven’t seen any dead seedlings yet, and they shouldn’t suffer from lack of moisture,” John Morris said. By planting brushwood it’s hoped the tree crop may one day provide a return. The species has increased in popularity in the Wheatbelt because they help tackle wind and water erosion, water logging, provide habitat for wildlife and are potential source of income as brushwood fencing. The Morris family also joins about 2100 Merino ewes with Poll Dorset rams each year, which means parts of the farm has to be fenced to keep stock from damaging trees. “The sheep add to the compaction of the ground, which then adds to the problem of water logging,” John Morris said. “The grant was great because it gave us the ability to plant more trees without the huge overheads,” John Morris said. “We’re slowly tackling parts of the farm where you can see a difference.